42 • October 2014 • S I G N & D I G I T A L G R A P H I C S DIGITAL PRINTING AND FINISHING DIGITAL GRAPHICS In the coming years, printhead and ink technologies will continue to push the boundaries for high-quality prints at high speed, improving productivity and reduc- ing overall running costs. Development of ink formulas will continue as consumers demand more environmen- tally friendly inks while still requiring a high level of adhesion and outdoor durability. Printing equipment is easier than ever to manage and this trend will continue as devices develop new automatic features and built-in diagnostics. 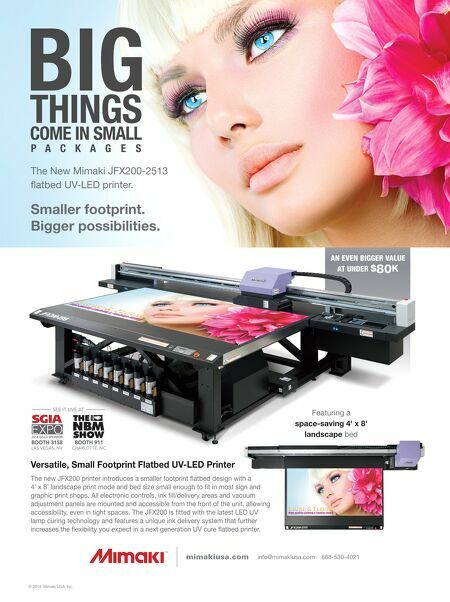 Fabrizio Soto General Manager Seiko Instruments U.S.A., Inc. Wide-format printing will continue to involve ink on media, so I don't anticipate any dramatic changes over the next few years as far as hardware and ink delivery are concerned. I do think we'll see ongoing advancements in software development, however—improvements that make wide-format printers even easier to use. Additionally, there will be continued advancement in the ability of these devices to handle unattended and remote workflow. Features and innovations that allow the user to communicate with the printer wirelessly, and control vari- ous printer functions via tablets, are features already available in new Roland wide-format models, such as the Versa EXPRESS RF-640. You can expect to see further innovation in these areas in the near future. Eric Zimmerman Roland DGA Product Manager Color Products The Durst Rho 312R features Durst's Quadro Array 12M print- heads with Variodrop technol- ogy for high productivity. 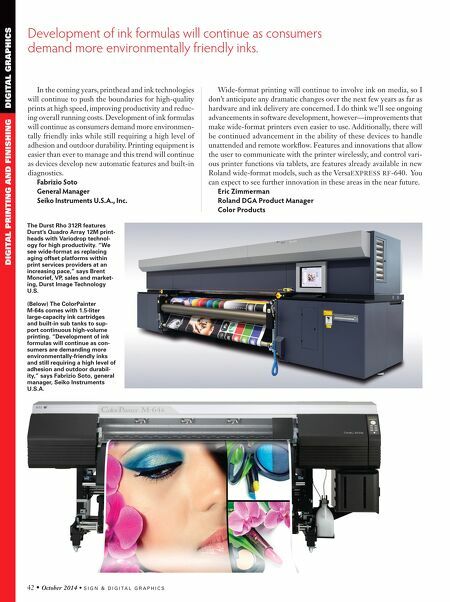 "We see wide-format as replacing aging offset platforms within print services providers at an increasing pace," says Brent Moncrief, VP, sales and market- ing, Durst Image Technology U.S. (Below) The ColorPainter M-64s comes with 1.5-liter large-capacity ink cartridges and built-in sub tanks to sup- port continuous high-volume printing. "Development of ink formulas will continue as con- sumers are demanding more environmentally-friendly inks and still requiring a high level of adhesion and outdoor durabil- ity," says Fabrizio Soto, general manager, Seiko Instruments U.S.A. Development of ink formulas will continue as consumers demand more environmentally friendly inks.